Naturally extracted, aromatic plant-based essences may be used to balance, harmonize and promote the health of body, mind and spirit. 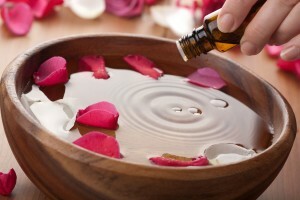 Aromatherapy dates back to antiquity. For instance, the Romans utilized essential oils for beauty & personal care products. The ancient Egyptians even used cedarwood & other essential oils for embalming. Many essential oils such as myrrh, frankincense & galbanum are mentioned repeatedly in the Old & New Testaments. Even then, these concentrated extracts were known to promote healing. They were used to “anoint” the stricken individual or to honor them. When therapeutic grade essential oils, obtained from reputable & well researched sources, are diffused and directly inhaled, applied topically or ingested, they can unify physiological, psychological and spiritual processes to enhance an individual’s innate healing process. Green Goddess works exclusively with Young Living & Mountain Rose Essential Oils. We also offer education about these essential oils, as they are extremely powerful, and should only be used after one researches the possible safety concerns. This specialized healing modality is designed to affect the WHOLE person, not just the symptom or disease, & to assist the body’s natural ability to balance, regulate, heal & maintain itself.